TRAP is the most popular shotgun shooting sport in America with some 55,000 active shooters that shoot an estimated 82.5 million registered targets per year. In trapshooting the shooters can stand anywhere from 16 to 27 yards behind the trap-house. The trap throws targets that will fly from 48 to 52 yards from the shooter. Most targets are shot when they are about 36 yards from the shooter. Targets are thrown at varying angles within a range of 45 degrees to the left or right of straightaway. National Shooting Sports Foundation research indicates that the average shooter breaks 13 out of 25 targets on the first try at trapshooting and gradually improves through the high teens into the low 20's. A perfect 25 is a reasonable goal for the novice trapshooter. Firearms: The typical gun for trapshooting is a 12-gauge with full or improved-modified choke and ventilated rib barrel 30-32 inches long. Although many top trap shooters favor over/under shotguns, single barrel, pump and autoloading shotguns are also common. 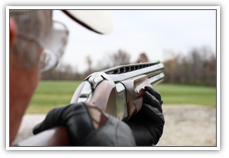 Ammunition: The shotshells used in trapshooting may vary slightly with shooters preference and wind conditions. The standard load contains 3 drams of powder and 1-1/8 ounces of # 7- ½, 8 or 8- ½ shot. Loads with only one ounce of shot are also popular. Regulation targets measure not more than 4-5/16 inches in diameter and 1- 1/8 in height, weighing 3- ½ ounces. They are composed of pitch and clay or limestone, are saucer-shaped and painted black with bright orange or white crowns. Trapshooting derives its name from the device which throws the clay targets into the air. Trap simulates the flight of a gamebird flushed ahead of the shooter and, in fact, in the original version of the sport, live birds were released from holes in the ground covered with silk top-hats. The first mention of trapshooting as a sport is found in a circa 1793 English publication titled "Sporting Magazine". The practice of shooting live birds from traps was first introduced in the U.S. in 1831 by the Sportsmen's Club of Cincinnati, Ohio. Targets first replaced live birds about the time of the Civil War. Early varieties of targets, designed to duplicate a live bird, included a metal "bird" with rotary wings and fragile, feather-filled glass balls launched from traps resembling medieval catapults. In the 1880's, clay targets such as the ones used today were first developed, with George Ligowskey of Cincinnati credited with creating the first clay target and trap. The first Grand American Handicap was held in 1900 in Queens Long Island and was the beginning of what has become the nation's most renowned shooting tournament. Between 1900 and 1924, the tournament site shifted annually - Chicago hosted the event nine times and The Grand was also held in Indianapolis, Kansas City, Cleveland, Atlantic City and St. Louis. In 1924, Vandalia, Ohio, a suburb of Dayton, became the permanent home of The Grand. During that first tournament, 400,000 targets were trapped - today, over 4- ½ million are thrown. Almost 6,000 participants travel to Vandalia each August to participate in the 10-day tournament.